Petit Fours are basically just little cakes, meant to be consumed in 2 bites or less. These are a touch big, as they generally shouldn't exceed more than an inch in height, but they're a tiny four-layer cake, and who doesn't like that? These petit fours were made for a wedding shower I did recently. 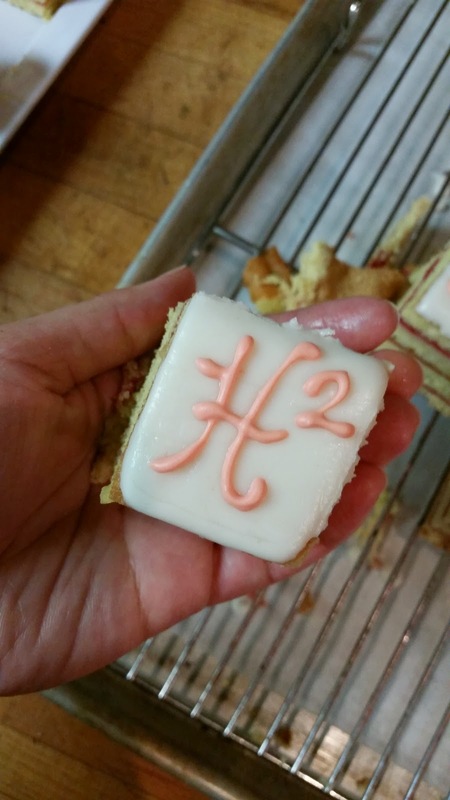 The surnames of the bride- and groom-to-be both began with an "H", so the hostess of the party thought it might be fun to do "H^2" on each one! Sift together the dry ingredients and set aside. Combine the yolks and whole eggs in the bowl of a standing mixer fitted with a whisk attachment and whip with the granulated sugar and vanilla paste. Start out on medium speed, for about 2 minutes, then scrape down the sides, and go to medium high for another minute. Finish on high when they're crazy poofy-looking. Take 1/3rd of the flour mixture and gently sprinkle it over the top of the egg mixture. Fold in gently using a spatula. Repeat the process until all of the flour is used up. Move to another bowl and then quickly rinse out your standing mixer bowl. Make sure that the whisk and bowl are DRY before going to this next step. Combine the egg whites and powdered sugar and whip to stiff peaks. This means that the eggs are glossy and smooth and not lumpy and dry. If you overwhip your eggs, don't fear--just add in another egg white and whisk that in. It should bring your whip back to life. Fold in 1/3rd of the egg white mixture to the egg yolk-flour mixture to lighten it, then fold in the rest, very gently. You don't want to lose your volume, so it's okay if you see a few little streaks here and there. Spread into two sheet pans that have been lined with parchment, as evenly as possible, making sure to get the corners. Bake for 10 minutes, or until the cake just pulls away from the sides of the pan. It's very important that this cake is baked well enough so that the bubbles hold up. Once the cakes are out of the oven and cooling, you can now focus on your fillings. You can use jam, ganache, or even your favorite buttercream. I used raspberry compote, spread thin. I also used simple syrup, which is a basic 1:1 ratio of water to sugar, boiled together. You can make a lot of any flavor you want, and keep it in the fridge for baking cakes, or sweetening cold drinks, such as iced tea. The simple syrup is optional, but recommended. But optional, still. When layering, do "Cake, simple syrup, spread. Cake, simple syrup, spread." until you reach the top layer, in which it's just simple syrup. Then, use marzipan, ganache, or a basic sugar glaze to decorate the top. You can also leave the cake "naked" and decorate each piece with individual berries and powdered sugar, if you're looking for a more natural feel. When cutting, remember to have a clean knife. Clean your knife between each slice using hot running water and paper towels to ensure clean cuts. And remember that a petit four should be consumed in less than 2 bites. I cut mine 4 * 6, but you can cut yours smaller or in different shapes. You can even use little cookie cutters to get the same effect, but make sure that they're small. If you're doing that, it might be prudent to cut the cake first before layering and filling, if the shapes are a little odd. 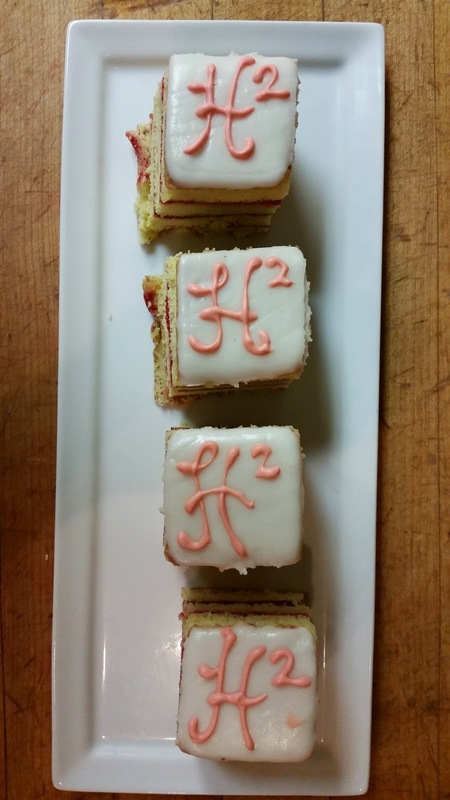 If you're decorating with letters or shapes, you can use icing, or candy melts. 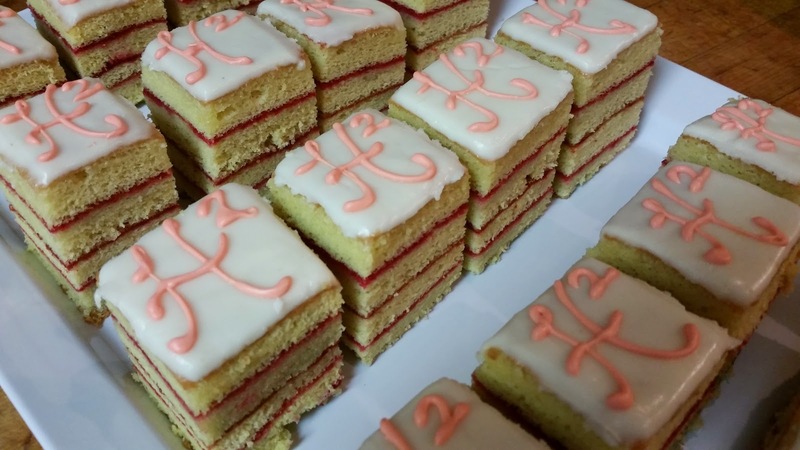 I used white Wilton candy melts, and then dyed in that pretty coral color before piping. These are excellent for baby showers, bridal showers, or for when you want to feel fancy while you binge watch "Marie Antoinette", "Amadeus," and "The Affair of the Necklace" in your underwear. I don't judge.